24/04/2009 | TUNISIAN RALLY : Meet the pilots ! A nice first special. Tomorrow I think it will start to get a little tougher. We are only at the start of the race. Nice to be back on a track, ‘cos since Dakar I haven’t raced at all. As always it takes a little time to get back into the road book, but everything went fine. A good first day on the piste. I am very happy because the bike worked perfectly. My goal on this rally is to win the 450 class and why not get on to the overall podium. Not a great day. During the special a policeman sent me the wrong way and I lost a lot of time – something which doesn’t make me exactly happy. What a pleasure to be back on an African piste. My old bones are arching a little, but apart from that I feel great. I started off slowly but I finished fast. I still remember last year and know I had to be careful. The BMW is an excellent car and will be the car to beat this year. We aren’t in a team race. We are 3 individual drivers and we run our own race. I am not sure if my goal today was to win the special. Last year it didn’t bring us luck as we had to retire the next day. Second isn’t such a bad place sometimes. I am really delighted. I am getting used to the car and gaining in confidence. Apart from the deviation I am happy with my third place. I didn’t take any excessive risks, just a lot of pleasure. The start of the special was very slippery and you had to be careful of the cactus, but overall these 60 kilometres were a pleasure. There was a little confusion at the diversion, but I think it was the same for everyone. We didn’t have any rain, but there were some big puddles. The day didn’t go too well for us. The diversion caused us to stop twice and we lost a bit of time. Still, the rally has only just started and we have a lot of kilometres ahead of us. »It wasn’t a special for us, too twisty and with too many changes of direction. It was difficult to get the right track. Even if the buggy lacks a little horsepower, she handled very well. No problem with the co-driver – he just got a smack!! We had a problem with the trip and the notes that Alex called were completely out – either too late or too early… Later on, without a windscreen, we had to slow right down for the big puddles. A nice warm up even, if the diversion could have caused us problems. Without comparing it to Argentina, there were quite a few spectators out on the course which was a pleasure to see. 12:15 pm : The first auto started > CHICHERIT Guerlain (n°302). 13:18 pm : motorcycle n°11 try to repair. 13:07 pm : 5 motorcycle are arrived. 13:05 pm : Motorcycle n°2 (DESPRES Cyril) is arrived. 12:48 pm : n°109 (SANNA COCCO Maurizio) did not started. 12:41 pm : The last motorcycle started > DABBAH FERJAMI Moncef (n°12). 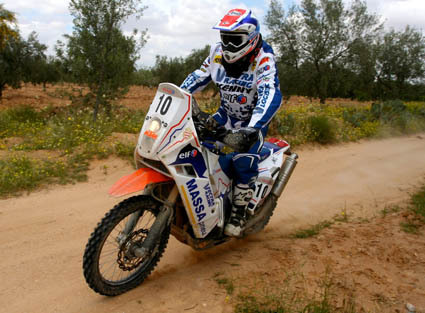 12:15 pm : The first motorcycle started > Cyril DESPRES (n°2). After an early road connection morning link to « The Kef », the rally starts in a forest. Narrow trails, lots of direction changes, in a mountain landscape, along the border. Then, the course becomes different, still technical but more speed. A special, which will make happy slide (between the trees) fans. Drivers good in navigation will enjoy the course. Eye pleasure guaranteed.